This technique is not wrong or trying to hide items necessarily — I use the same technique with DeliverTheWord.com. For this example, the obscurity is TOO OBSCURE unless folks have a reason to look closer. How we run our race is important! As with all that we do, we should do all as unto the Lord. More important to my mind is being able to maintain a Good Testimony during every level of the race – it is the “How” we do things that can have such an impact on those watching to see how “real” our relationship is with our Saviour. So many times we want to make comparisons as the relationship factor in looking, discussing or considering our stand/position with another person, which is contrary to the Bible. Each of us have a competitive streak in us in some area of our lives, which can – even in an instant – cause us to be critical in a manner unbecoming of a Child of God. As we are running, we want to do so with a testimony and integrity that speaks more than we may say with our mouths. What a solid statement and truth – because how we treat them is how they may feel or thing that our Heavenly Father might treat them. The race is not a comparison, but it is one of character, honesty and contest. It does not mean that there will not be comparison, goal setting and achievement – we are to remember the focus should not be those things. Competitiveness is NOT a bad thing as long as we keep the right perspective and eye on the prize of the High Calling that it is – unto our God. This Series focuses on the reason to run and how we should run our race. Beginning with how to begin and who we are running for, with and for the benefit. Each of us will find ourselves in various races on any given day, the most important one is the Christian Life. There are phases of our daily lives that may not be a stumbling block for us, but we need to “stop & watch” to find out who it may be a challenge – then adjust. These fifteen (15) items are areas which would help every Christian to consider how we are running. 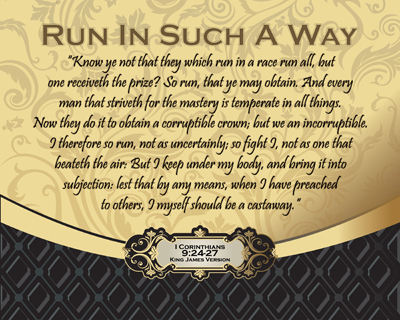 We each should “Run In Such A Way” that uplifts our Saviour, Honors our Heavenly Father and Encourages others to join in the race, to run their race to win for the Cause of Christ! Connect with us on Facebook! Make sure to LIKE to place on your Wall/Timeline. On-Line Catalog of Prints Available from DeliverTheWord.com on Flickr. Copyright © 2003-2016 DeliverTheWord.com. All Rights Reserved. Each one of us that are Christians can learn the simple Plan of Redemption (given and documented on The Experience page), with just a few verses to recall and/or look up when we have the opportunity to witness to others. We should be able to hide these in our heart, such that the Holy Spirit has them to bring to our minds when we have the providence provided time to share. You and I must ask ourselves, searching deep within, whether or not our “Redemption” is worth sharing with others! We are indeed trusting in that Redemption to get us to Heaven, aren’t we? When we have something exciting happen in our lives, we are ready to tell the world – whether or not they seem interested in hearing what we might have to say. We have the most IMPORTANT happening in all the world to tell them about, the Experience of Eternity. At the time that Romans was being written, the known world was hearing something exciting – Jesus Christ had come to Save, Heal and Serve – the King of Kings and Lord of Lords, serving others so that they might have Salvation through Him. 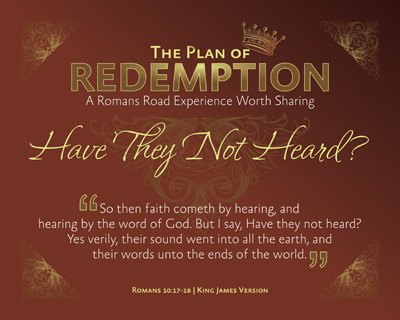 Given that we will use the Romans Road Experience, noted as the Plan of Redemption is this Series, we can find at least eight (8) passages of Scripture that will help us understand what the Redemptive work has, can and will do for us individually and together as Brothers and Sisters in Christ — Brethren. This Series has been one of simplicity for me – one where the Holy Spirit has been able to speak clearly to my heart, convincing me that in such a chaotic world which we live – people need the Lord. A quick, albeit sad, search on “plan of salvation” and/or “plan of redemption”, yields an incredibly varied, warped approach to sharing God’s Salvation/Redemption Plan. From “festivals” to “baptism as salvation”, the field of possible “options” almost seems endless – FAR from the Bible presentation of Salvation. Levels of “happiness” and “nine pages of life” have NOTHING to do with Salvation through God’s Plan of Redemption. It is not complicated, or is it? I’ve found that sharing the Gospel and explaining Salvation to an 8 to 10 year old, to a teenager, to a young adult all the way through to a senior adult uses the EXACT same verses of Scripture. They ALL have about the same questions – maybe worded differently and with different focuses (age appropriate) – and it takes the same Holy Spirit conviction on the inside of them for Redemption to take place. When that Miracle of Salvation happens in another soul, my ENTIRE system goes into Holy, Holy, Holy Hallelujah mode – does yours? Every Christian should make it a priority to learn how to share the Gospel with those they come in contact with – the next appointed time could be the last time that person gets to ask God to forgive them and place their faith in the One who can Save them. Have you ever been told that what you are looking for is RIGHT in front of you? But, still you either cannot find it or just plain don’t get it? The Christian life can be a little like that too. We have the tools, beginning with God’s Holy Word, then SO many companions to help us along which can include dictionaries, commentaries and language translation tools. Oftentimes it may be presented that we have more information than we have ever had before us, but on the other hand have by far a less literate Body of Believers than even in the dark ages. Strong words? Yes, considering the Scripture used for this Series doesn’t require any other resource but the Holy Spirit, which every Born Again Believer has a full dose already occupying the Temple that God the Father wants SO desperately to have fully consecrated to Him. EVERY single one of us, no matter our age, has at one time or another NOT been fully surrendered to God in some manner, matter or situation. We are NOT perfect, which could place us as Christians in this fluid situation on a daily basis, if not by the hour at times. Be honest with yourself and before a Thrice Holy God, it is a struggle that the imperfect man, woman, boy or girl finds themselves in if they are breathing and aware. The process that Paul is referring to by Inspiration of the Holy Spirit, is just that, being transformed continually and being renewed continually, so we may prove Him. As with any process of improvement, adjustments have to be made – which is what the “renewing of your mind” is referring. We are to “prove” by examination, seeking and trial, so that we are able to determine “what is that good, and acceptable, and perfect, will of God”. We will make sacrifices to do so and the world will NOT follow along willingly, because their desires run contrary to those of God’s and His Holy Word. By each item we test, determine to be good, acceptable, perfect, will – our will changes, NOT God’s Will. 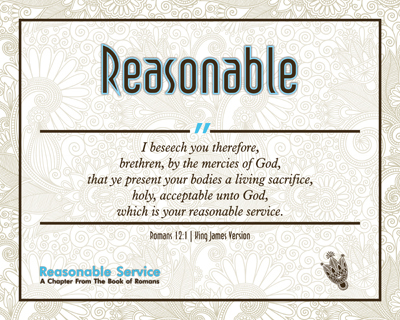 We do so by God’s Mercy and it is ONLY Reasonable that we do so. Our Faith will be tested at each turn – if it is NOT being tested, it’d be recommended that we stop what we are doing, drop to our knees and pray about finding out why. It is also possible that we are set on “cruise control” so to speak, where we have somewhat disengaged ourselves from what we should be doing because we have gotten comfortable where we are. Of course, that DOES NOT MEAN we are supposed to be MISERABLE where we are either. 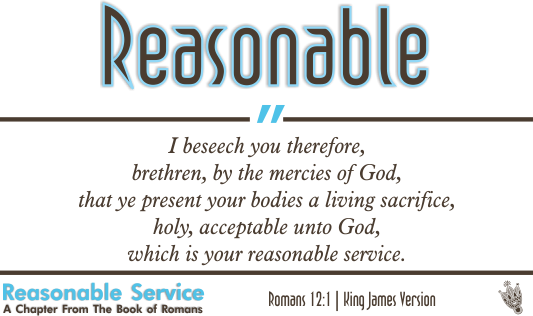 First we have to be Reasonable – in God’s economy, NOT the world’s, which makes us acceptable unto God and it is ONLY reasonable that we would want to Serve Him. There are fifteen (15) items in this Series in which we can take a review of in our lives, with a simple, very plain set of guides – the short form of them are provided for every Christian to review. It started with us having to check for Evil in our motives and will end by our Overcoming of that Evil in our lives through God’s Mercy and our Reasonable Service unto Him. This Series has been sitting for such a time as this, one where a kick-start would blossom into an ENCOURAGEMENT session that could be felt rippling across actual lives – ours and those people that we know who may have a hard time weeding through all the mess that can come at a person these days. All too often, we have labeled folks, cast them into a corner or just plain boxed them up because of what we’ve heard said about this or that about them. Christians – and I say, CHRISTIANS, stand up and say THIS IS ENOUGH – it is about time we started getting at the TRUTH. Seek IT, Eat IT and SPEAK IT. The formula for putting it together immediately rang out “Speak The Truth!” – now it is time to reveal it and what this Encouragement Series discovers. Each part of the statements, both Beverly’s and mine, divided down into chunks of statements that reminded me of verses of Scripture. An everyday challenge and reference, now had application – we have the guidebook RIGHT in front of us. When a person is absorbing the Word of God, it will POUR our of them, which is EXACTLY what happened with this Series in preparation. Now we have a new tool, a set challenge, will we just plainly “Speak The Truth!” to those who so hopelessly are without and outside of that Truth? We, Christians, have to GO to them, go to where THEY are, being willing to give of ourselves, to be poured out in front of them and into their lives. What we take in, does come back out — we should be overflowing in God’s Love. This Series is about some of those things that we can do with what we have right now – it requires NO money, NO orator, NO unreasonable expectation… These are things that ANY Christian can do, no matter where you are, where you live, what language you speak – it is speaking and sharing about the ONE and ONLY True God in Heaven, His Righteous Son and the Indwelling of the Holy Spirit in every Believer. We see and hear things being spoken about our Country returning to God, returning to being a God Fearing Land and us to have a Love toward others as the Lord loves us… I’ve got an interesting thought – why not right here, right now with what we do know and have, Christian!? 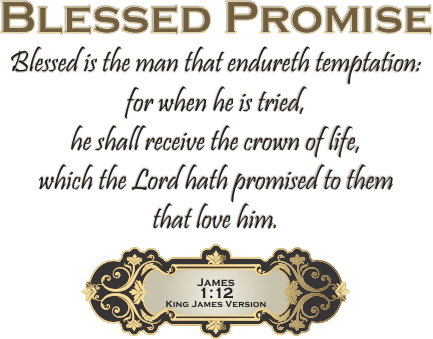 We say that we “Trust” Him and He is to be “Praised”, for it is “Written” because He is the “King of Glory”, RIGHT!? Then, how many people have you told that to today? As a Christian, we’ve had to TRUST Him, so when someone is on the fence about how they could possibly “Trust in Him” – merely tell them how you did. I know, I know – WAY out of our comfort zone, right? How else do we think that our Heavenly Father is going to heal our marriages, relationships with others, homes, communities and our churches? Could it possibly be that the “Christians” are the ones who need to get a REAL dose of God’s Reality first? We DO NOT have to make anything up, we have a “play book” if you will, which has the answers to all the “hard questions” in it and the HOLY SPIRIT to translate it for us. 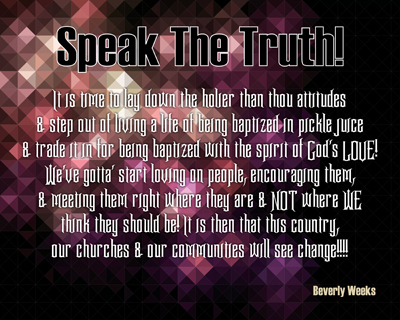 IF there has EVER been a TIME to SPEAK, it is NOW – while we still can… Beverly would say we need to STOMP on that ole Devil and RUN him outta here – I happen to AGREE with her! Now GET! Hallelujah, Praise the LORD! We as Christians can and will Walk with our Saviour, just as Noah did with God in Genesis 6:8-9 — not of his own merit, nor we on our own, but because we have found Grace in His eyes. We live in one VERY forsaken land and time, a place where man has called “good” evil and “evil” good, which is increasingly becoming more hostile and faithless. Interestingly enough, as a result of removing God’s Word, the Bible, from our everyday lives – we’ve forgotten, or at the very least do not realize, we have a Book of Books with actual answers in it, telling – sharing – giving us a Guidebook on life – largely unused. Down to the VERY last words penned from Inspiration, we have the “how” to not only make it through, but to do so with a measure of success in the end – Revelation 22:20-21. How are we to do it? Through Grace, by Grace being with us – whatever may come our way – we can find over and over in God’s Word that an abundance of Grace is to be had by those who will Believe, Lean and Trust that it will be so — every time. As has been said by many folks, we know what happens in the end – because we ready the end of the book – WE WIN! Now comes the interesting part, how that really happens… It happens by Grace being with us – it is our Lord’s Grace, the Saving Grace, God’s Grace given to the Children of the Living God by His OWN Son – Jesus Christ. 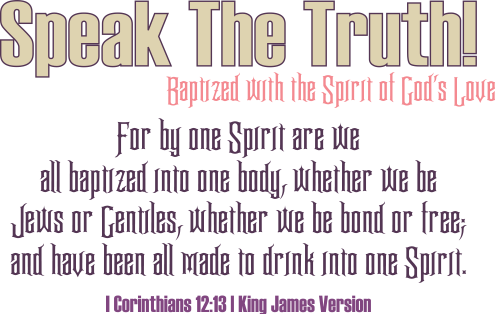 If we are to have it, we have to get it through our Saviour, with the Guiding of the Holy Spirit. Finding the ribbon of Grace throughout the Bible in situations, times and events of SO many, varied life instances will do something to you – no matter where you find yourself. Grace abounds MORE than to just our current needs, it extends WELL past any current need we may be experiencing, right on into the Eternal through Redemption that is found in Jesus Christ ALONE. The passages incorporated into this Series are incredible pictures of Grace being shown to sinners JUST like YOU and ME. And the LORD said unto Moses, I will do this thing also that thou hast spoken: for thou hast found grace in my sight, and I know thee by name. And he said, I beseech thee, shew me thy glory. And he said, I will make all my goodness pass before thee, and I will proclaim the name of the LORD before thee; and will be gracious to whom I will be gracious, and will shew mercy on whom I will shew mercy. In the Bible we find Noah was the first to find Grace and in the end, it will be the Grace of our Lord Jesus Christ that will testify one last time on our behalf. Throughout the Bible in twenty-eight (28) additional passages of Scripture we have proof of how Grace Wins in the lives of those being shared with us and how we have access to that very same Grace in our lives as Christians. Had not thought about this set being SO large, for it has thirty-three (33) images included, with three of them being lyrics, with only those three not straight from the Bible. 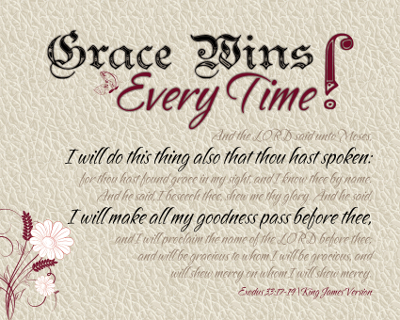 There is a print for every day to serve as a reminder of How Grace has won, is winning and will win longer than any challenge or problem that might be presented in our pathway. Many of these passages may be familiar with seasoned Christians – I myself could nearly quote majority of them for the portion of where “Grace” was used and the context it was placed for that instance. Better than just being head familiar with them, are we heart Encouraged by them when they are read, heard or noticed being played out in front of us? By being able to identify personally with what another person has been going through, had challenges concerning and/or living in a situation similar to that described, a connection can be built that makes it real in our lives and the lives that we influence for the cause of Christ. Others can and will see that in our lives, almost without us even trying to make it known, because there is a positive attraction to those that have Grace overflowing in their lives. Whatever may be spilling over, may we strive to “Believe” what our Heavenly Father is doing in our lives is for our good and that the “Grace” extended to us in our time of need through Jesus Christ our Saviour, is all we need – every time we need it.